The performance of Morphine by the Art-Vic Anglo-Russian Theatre is about a deadly addiction. This is one of the eternal themes that is now more relevant than ever. With frightening frequency we read in newspapers about people, many of whom are the nicest and most talented, but are dying of this powerful and enigmatic illness. Amy Winehouse was asking her local barman not to sell her any alcohol, even if she was crawling on all fours and begging for it. A couple of days later she was found with three empty bottles of vodka by her dead body. Did she voluntarily choose to do this to herself? As Woland in Mikhail Bulgakov’s novel The Master and Margarita says, “Isn’t it more correct to say that someone else has done this” to her? Young Bulgakov became addicted to morphine when he was working as a country doctor, so he knew its power of destruction from his own experience. In Viktor Sobchak’s production the deadly drug is impersonated by a character called Morphine (Ged Petkunas) wearing a mask and a cloak, acting wordlessly, but gradually forcing young Doctor Polyakov (Dima Sol) to kill himself. However heavy the subject is, the director manages to create not just a dramatic, but also funny, light and moving performance. 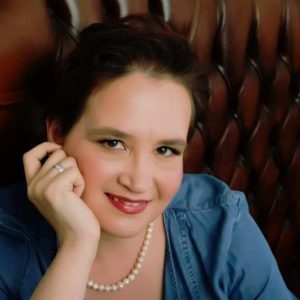 It begins with sounds of Verdi’s “Aida” when Polyakov, with a flower in his hand, modestly awaits his opera singer wife Amneris (Angelika Fomina), only to drop it on seeing her leaving him with another man (Ged Petkunas). Reality and dream, life and stage are fused together in this first scene, lit in red infernal light, and this phantasmagoria deepens and gradually prevails throughout the performance. But at the beginning we see just a young, heartbroken man, crumpling his coat in his hands in despair and deciding to escape from Moscow to a village to cure peasants, who “won’t be able to open” his wound. Dima Sol as Doctor Polyakov possesses that subtle quality of a sensitive, well brought-up and thoughtful young man that we saw in his portrayal of Treplev in Sobchak’s production of Chekhov’s The Seagull a few months ago. It seemed then that he was gently and carefully approaching one of the most tragic roles in Russian literature, but in Morphine he allows himself to go deeper into his character’s “story of an illness.” However, even at the end, he does not perform a shaking junkie, but remains just a deeply suffering young man with pure eyes. The first excruciating pain that makes Anna (Anna Danshina) administer morphine to Polyakov he experiences not in his stomach, as written in Bulgakov’s story, but in his heart: it comes straight after he dreams about his wife. This meaningful detail says a lot about Sobchak’s directing style: he often cuts out all the characters or details that do not relate directly to the gist of his interpretation. On the second occasion Morphine enters Polyakov’s system of his own accord. Morphine creeps on stage and pulls invisible strings like a puppeteer making the doctor inject the drug. As soon as it has been taken, Polyakov loses his own will as well as his moral qualities and becomes a mere puppet at the hands of Morphine in his world of rasping and mocking, sharmanka-like music.This is a powerful metaphor of the nature of any addiction. 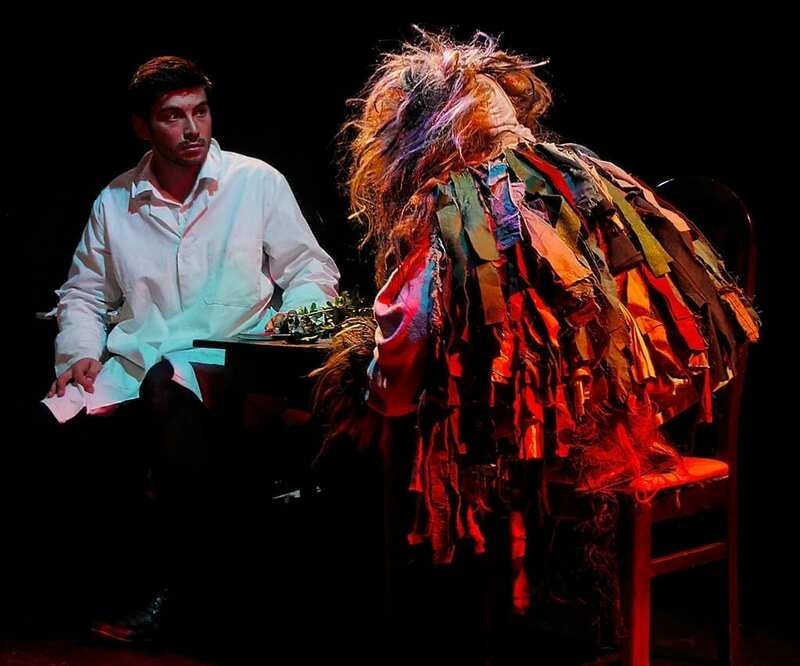 Morphine has many faces in the performance and he comes to talk to the doctor as a funny ball of feathers, Brownie, performed by the same actor, but unrecognisable. He is full of jokes and, while discussing with the doctor his fears of patients with various complicated illnesses, he reminds us of the cat Begemot from The Master and Margarita. The director has added to “Morphine” characters from other stories from Bulgakov’s A Young Doctor’s Notes, such as a father crying in despair (Dainius Valutis) because his daughter’s leg has been severed. 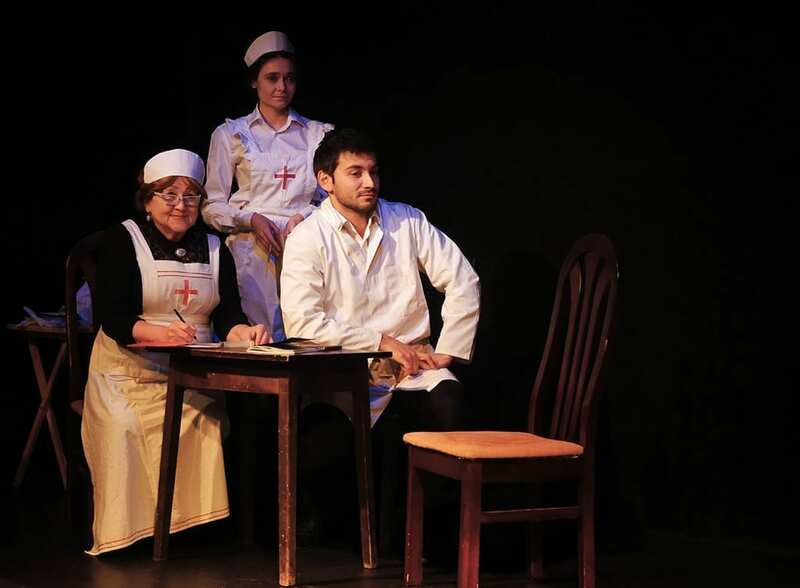 The scene of the operation is powerful in its simplicity: Anna and Pelageya Ivanovna (Larisa Volkova) stretch a sheet in front of the trembling doctor and the light turns it red. The next scene is intense yet simple in its emotional truth, when the grateful father falls to his knees in front of the doctor. The production is performed in a pub theatre, in a room with just a few mismatched chairs and a little table. The rest of the set is created by changes in the lighting. 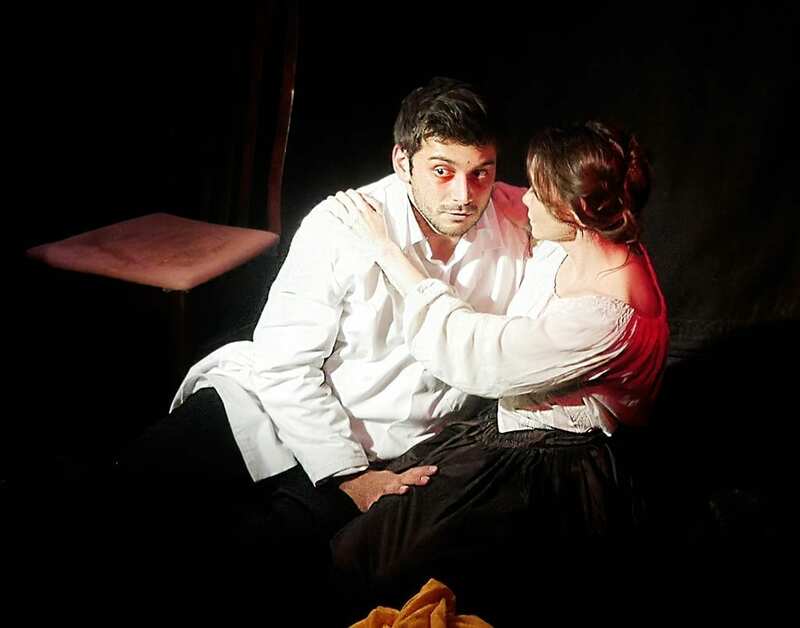 The rhythm of the performance is formed by a combination of splashes of loud music and exaggerated acting and silence when Polyakov quietly reveals his soul in his diary or to his devoted lover Anna, performed by Anna Danshina with tension and the fatality of a woman in love with an addict. Sobchak creates a convincing structure of the performance, based on the repetition and rhyme of creative elements, which are similar throughout the performance, but are also transformed and intensified. Thus, Morphine repeatedly visits Polyakov, but each time the sharp and shrill music that accompanies his appearance differs and becomes more dramatic. When Polyakov describes his “pain, horror and fear”, he is repeatedly pushed to the ground by Morphine, who dances around him and offers him his hand in a blood-red glove to help him to get up, only to throw him back to the ground. But the next time Morphine visits him, Polyakov talks already about death itself and Morphine dances around him as a whirlwind, in the likenes of a scary old lady. We see two parallel worlds, visible and invisible, and this also makes this performance even closer to Bulgakov’s last novel. Scientists discovered traces of morphine on the pages of his manuscript of The Master and Margarita and believe that the dying Bulgakov was using it in order to relieve pain while finishing the novel. Whether it’s true or not, there is no doubt who Morphine is when he puts a gun into Polyakov’s hand – “This is the mixture of the Devil and my blood”. The divine singing of Amneris accompanies Polyakov’s death, as if reminding us of the alternative of turning to God that he never explored.